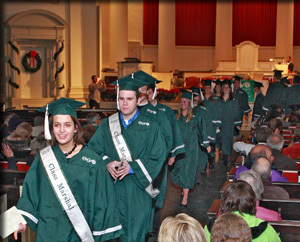 ESF celebrated December Convocation as 129 students moved on to a new chapter in their lives. “We’re here to celebrate the success of our students and to toast the next stage of their lives,” said Cornelius B. Murphy, Jr., SUNY-ESF president, at the opening of Convocation ceremonies Dec. 7. 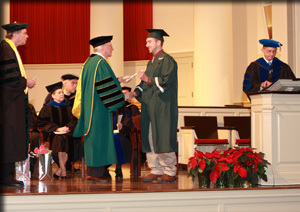 The College awarded 129 degrees, including 13 Doctors of Philosophy, during the ceremony. Murphy spoke of the interconnectivity of global environmental systems and the consequences of uncontrolled economic growth and industrialization. He challenged the graduates to tackle the tough environmental issues the world is and will be facing. “We turn to our graduates for solutions and to catalyze a green industrial revolution,” he said. 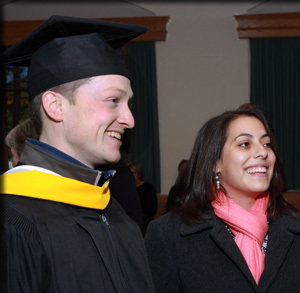 ESF honored three alumni during Convocation: Dr. Edwin Ketchledge, Dr. Ronald Eby and Dr. Mary E. Fowkes. Ketchledge ’49 received the ESF Lifetime Achievement Award. During his tenure, Ketchledge was a beloved mentor, advisor and role model to ESF students. He focused his career and retirement on protecting the Adirondack high country, including starting a citizen-driven Summit Stewardship program to protect the High Peaks. Eby, ’69, ’72, ’74, and Fowkes ’77 received the Alumni of Distinction Award. Eby, this past summer, received the National Medal of Technology for his work developing the vaccine Prevnar, which has reduced by up to 75 percent the number of ear infections and cases of pediatric pneumonia and meningitis caused by the Streptococcus pneumoniae bacteria. Fowkes, who has distinguished herself as a medical examiner for the City of New York and advised U.S. Sen. Hillary Rodham Clinton on medical issues, urged the graduates to use what they learned at ESF to make great discoveries. Following the ceremony in Hendrick’s Chapel, the celebration moved to Alumni Lounge in Marshall Hall, where students shared their accomplishments with family, friends, faculty and staff. Derek Earl Pursell looked every bit the ESF student, wearing a black Jansport backpack — complete with a wide-mouth, reusable water bottle stuck in a side pocket — over his green academic gown as he chatted with his family during the reception. 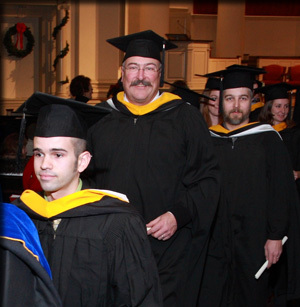 He earned a bachelor’s degree in natural resources management. He is investigating the job market and considering a stint in the Peace Corps. Originally from Pennsylvania, Pursell relocated to the Syracuse area with his family four years ago. Emily Gates of Mechanicsburg, Pa., was happy about completing her bachelor’s degree in environmental studies/communication and culture, an area that allowed her to combine her interest in communications and science.